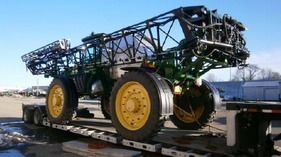 **The John Deere industrial sprayer above is one of the many larger shipments we’ve transported. In addition, one of our most recent projects was transporting a 60,000lb semi truck to Brisbane, Australia. To combat this, especially with longer shipment durations, we shrinkwrap newer vehicles and equipment. Shipping oversized cargo that has been crated and vehicles that aren’t running are quite common with this method. For more information on shipping heavy equipment, contact one of our specialists today or visit our gallery section to see more projects!